Loire Top stands for the upper part of the floorstanding Loire. Loire top contains a 30 mm dome Wavecor TW030WA10 with silk membrane and a 18 cm woofer Wavecor WF182BD12 with glass fibre fabric membrane. The box is constructed as a closed box, which provides a very clean, dry bass. The housing consists of 6 plates, it is easy to build. 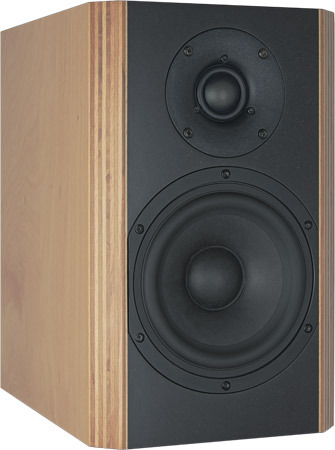 The crossover consists of a 3rd order high-pass filter (18 dB per octave slope) to control the silk dome tweeter and 2nd order low-pass filter for the control of the woofer. Parallel to tweeter and woofer still absorption circuits are arranged which correct the frequency characteristics without worsening the impulse accuracy. The frequency response is quite flat, the non-linear distortions are absolutely low. This can be found in top-class speakers. The decay spectrum shows a small resonance at 500 Hz; apart from that it is without any fault.